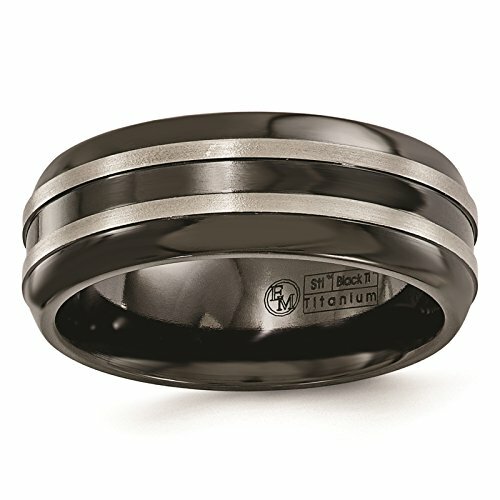 Titanium Black Ti Grooved Polished & Brushed Finish 8mm Wedding Ring Band Size 8.5 by Edward Mirell. Comes in a Beautiful Custom Edward Mirell Ring Box. Features: Polished - Titanium - Brushed Finish - Grooved - Black titanium. * Each piece in Edward Mirell's Black Ti collections possesses the same benefit to the consumer as gray titanium. However, it provides a rich, clean and distinctive black look to the metal that will not chip away and is not an "applied" coating. * Black Ti is a proprietary alloy that miraculously experiences an atomic transformation at the molecular level to become as hard ceramic. The titanium turns black from the outside in by exposing the element to extreme heat. * The severe hard attribute created through this unique and exciting process yields a supremely scratch resistant surface in Black Ti pieces. * Black Ti is very amenable to hot or warm forging. It exhibits super plasticity at about 732°C making it possible to accurately produce sharp corners, indentations, and other details.